The Lewisburg area is fortunate to have a school system that has been a source of pride in the community for generations. Our schools are immensely important local assets that make the community attractive to businesses and new residents. Lewisburg area schools are known for high quality teaching, diverse athletic and extra-curricular activities, high-level test results and outstanding college placement. To further its support of programmatic priorities within the LASD and to enhance existing and planned capital projects, the foundation embarked on an ambitious multi-year comprehensive campaign to raise $2.5 million. As of November 1, 2016 we are 86% there! • Multi-year support of programs. • Outright Program Support (annual “pass through” gifts). The total goal for the campaign is $2.5M. 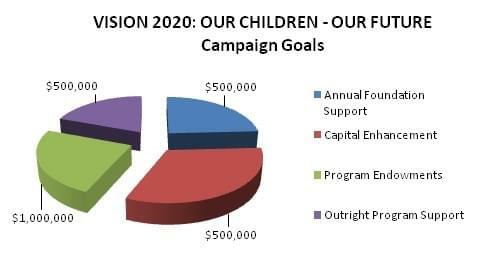 The VISION 2020: OUR CHILDREN – OUR FUTURE Campaign offers donors a variety of naming opportunities never before offered within the school district. Working closely with the LASD School Board and school administration, the Foundation has been granted exclusive rights to offer naming opportunities within the planned new high school. The Foundation is also offering naming opportunities with programmatic endowments. With your support, The Green Dragon Foundation seeks to provide our students with leading edge facilities and an advanced curriculum that will create an enriching educational environment where students can grow, learn and thrive. Gifts from concerned individuals and families, businesses, organizations and foundations become investments in children, in our future and in the Lewisburg community.